This was one of the old style of chases - more relaxed and learn more about what is going on within the various situations. The conditions on this day was forecasted by the models to produce reasonable wind shear but decreasing particularly further south. There was an impressive moisture profile and LI of about -1 or so according to the models. This meant marginally severe storms could develop. There was a lack of convergence but the mountains could act as a trigger. Geoff Thurtell and I arrived in the Bathurst region by about 1pm. There was no activity anywhere except large cumulus - some indicative of the instability. Winds were northeaserly light to moderate in strength. After lunch, we met up briefly with David Carroll - great to catch up again. He could not chase unfortunately. So Geoff and I parted and headed to the top of Mt Panarama. Some excellent views to be had from here. "Wow!!! Look at that". There was an anvil developing - and another one!!! Nothing major but I was surprised since it was shielded from view in the town. Then a move to the other side of the hill for western and southwestern views revealed the other storm nearer Orange - definitely the first to initiate. 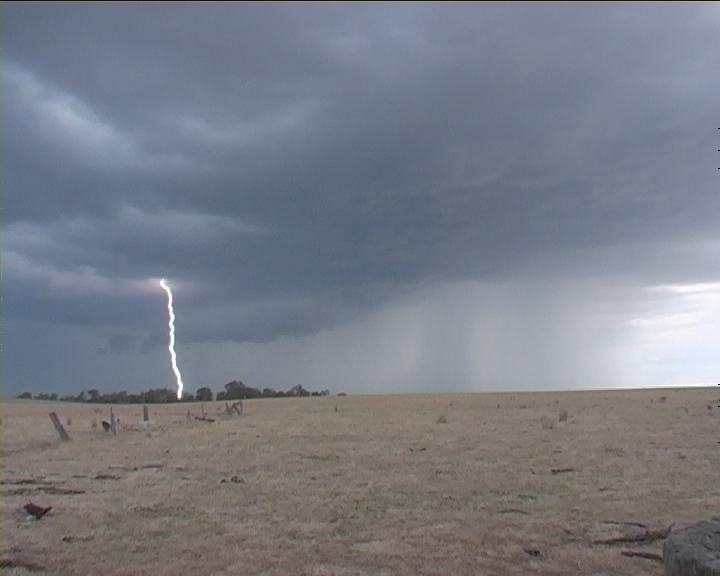 After a short video pan, we headed for the storms which were gradually extending up from the Blaney area. Locating nearer the second southwestern developing storm, we parked within view about 10km from the storm. At this stage, the lightning activity increased somewhat. 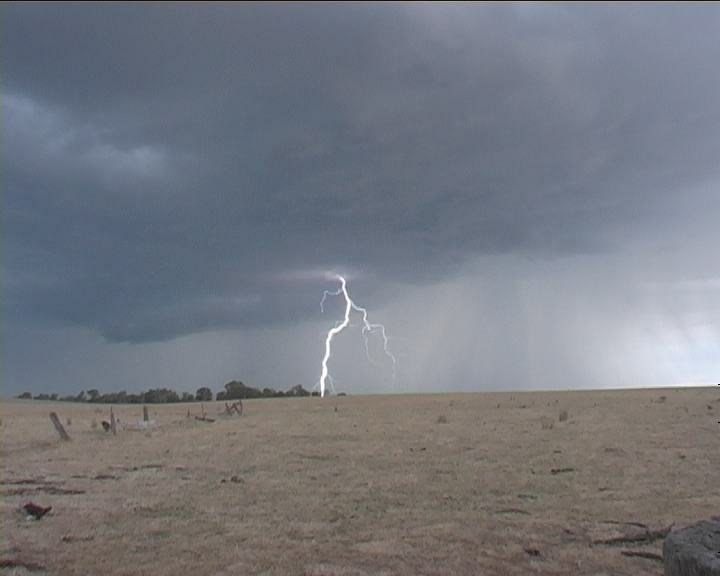 I set up the video camera to get some lightning shots - some of which are shown in the stills below. 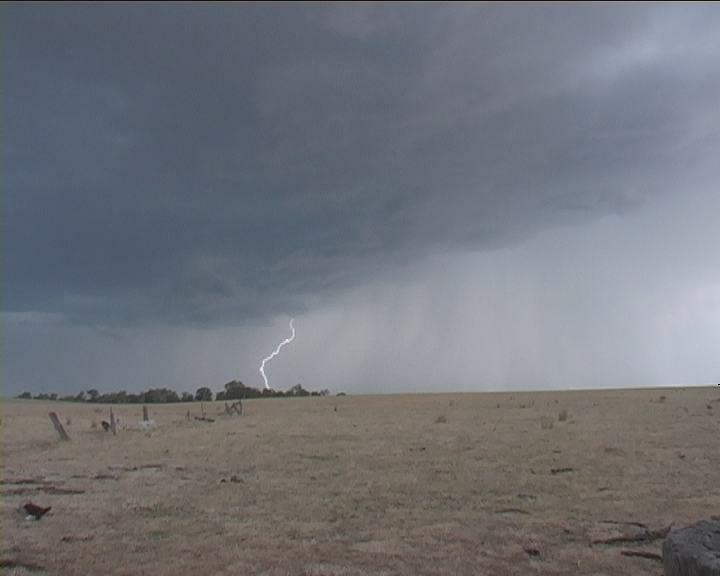 The lightning activity lasted for about half an hour and then the storm began to weaken. More static suggested to me the storm to its south must be intensifying. Unfortunately, all we got was rain and a close strike. This storm was backbuilding into a less favourable wind shear environment. After some time playing around near this storm, we lost interest and made our way back home enjoying a meal out at Richmond. It was a good relaxed day's chasing - something I had not done for some time.